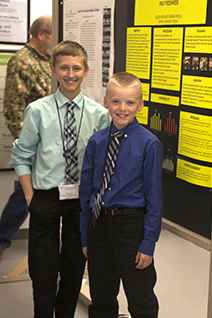 Middle school students (6th-8th grade) have the option to present only in a poster contest or they may make both oral and poster presentations. Students will choose their preference when registering. Posters may be a maximum of 4 ft high by 4 ft wide or smaller - no exceptions. Middle school students stand with their posters during judging. 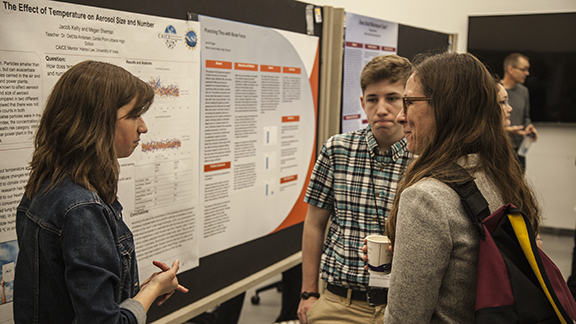 High school students (9th-12th grade) prepare a 10-minute presentation and a poster describing their research. Posters for 9th-12th grade will be stand-alone during judging. Students will be making oral presentations during poster judging. Posters may be a maximum of 4 ft high by 4 ft wide or smaller - no exceptions. See details and tips below including a suggested template for making your poster. All IJAS participants will be honored at the IAS Awards Luncheon and receive a certificate of participation. IJAS members are not required to present research to attend. All IJAS members are welcome and encouraged to attend. The student doing the presentation must be the one who conducted the research. No student may present research from a previous year without conducting additional research on the topic during the current year. Only one project per student will be eligible for prizes. No student may compete at the middle school or 9th-11th grade levels in more than 3 different years. No student may compete at the senior level more than one year. A maximum of 3 students may work together on one project. See below for how awards will be split among group projects. In the 9th-11th grade category, the prize is a trip to the next American Junior Academy of Science Meeting. If a project completed by a group of student's is selected for this award, the student's must either pick one individual to attend the conference, split the award and raise the additional funds for all to attend, or forfeit the award to one of the alternate winners. For the 12th grade category, projects by teams of two students shall be accepted, however a winning team would split one scholarship. Students must meet the eligibility requirements described above and preregister for the conference in order to compete. Please also bring a photo release form (ijas_photo_release.pdf). The IJAS Registration Page includes the IJAS Photo Release form and options for submitting it to the Iowa Academy of Science. The mounting space is four feet wide by four feet high. Larger posters will not be allowed. The allowed presentation depth of no more than 1/2 inch. The title and researcher's name should be clearly visible at the top. An abstract of the project should be in the upper left-hand corner of the poster. It is suggested that all lettering should be at least 3/8 inch or 26pt font. 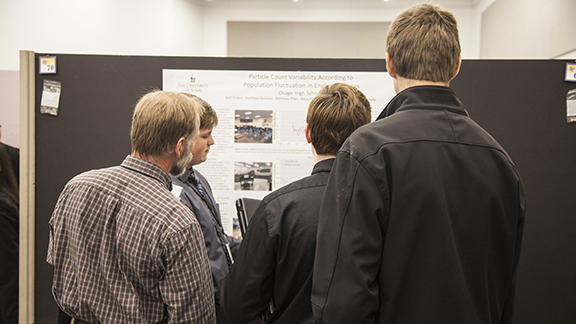 Keep in mind that the lettering and illustrations will be viewed from distances of 3ft or more and that judges have limited time at your poster. If you include more information than is necessary to communicate your project, your score will suffer. Avoid unnecessary details in preparing charts, drawings, and illustrations. Keep everything as simple as possible. A poster that communicates clearly is better than an 'artsy' poster. Color should be used only when it aids in understanding or readability. This doesn't mean don't be creative, it means be sure your creativity serves the purpose - communicating your science! Numbers, letters, or arrows can be used to indicate a preferred reading sequence. The poster should be self-explanatory. Students in 6th-8th grade will be at their posters when judged. Posters from 9th to 12th grade students will stand alone. Projection equipment and electrical outlets will not be provided or allowed in the poster area. The poster presentation is in essence a bulletin board. It is not an exhibit of the type found in science fairs. There will not be space for equipment, research notebooks, specimens, etc. The presentation will not exceed a maximum time limit of ten minutes. A timekeeper will give the researcher proper notice of the time. No reduction in score will be given for a presentation of less than ten minutes which communicates the project clearly. Scores may be reduced for presentations which go over the time limit by more than a minute. The researcher may use notes in his/her presentation, however reading the report to the judges is considered bad form and will result in a reduction in points. The researcher shall not be interrupted during his/her presentation. Judges will hold questions until the end of the presentation. No three-dimensional objects may be used in the presentation. Any two-dimensional representation (charts, pictures, graphs, overheads, power point slides, etc.) may be used, but only to supplement the talk and not to replace the speaker. No videos. No material may be passed to the judges and only a technician may assist with the use of audio equipment. Upon completion of the presentation, the researcher may be questioned by the judges for a period of up to five minutes. Other members of the audience will only be allowed to question the researcher after judging is complete and if there is time. If you use PowerPoint or other slides, it is suggested that you keep your number of slides to 16 or less.